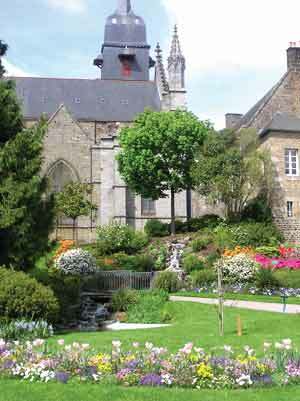 Right next to Saint Leonard church, the public garden offers a remarkable view of the castle, Saint Sulpice church and the surrounding countryside. The descent to the medieval parts of the town, and so to the castle and the site of the ”Rocher coupé” with its turquoise waters, is punctuated by a band stand, a 17th century water basin and a collection of ferns. Our walk takes us next to the garden of the Val Nançon. Right under the ramparts, this mosaic garden is an invitation to travel. Bamboos and kitchen gardens grow next to the ”Oeuvre à la vie”, a contemporary work of art elaborated with children. From April 16 to October 15 from 8 a.m. to midnight. From October 16 to April 15 from 8 a.m. to 10 p.m. The public garden is the starting point for the tour of the parks and gardens, but also of the literary circuit, which goes through the town. In the town centre, right next to Saint Leonard church.